Your input will help to create a community-supported vision connecting the City’s plans with your needs and ideas for healthy streets! 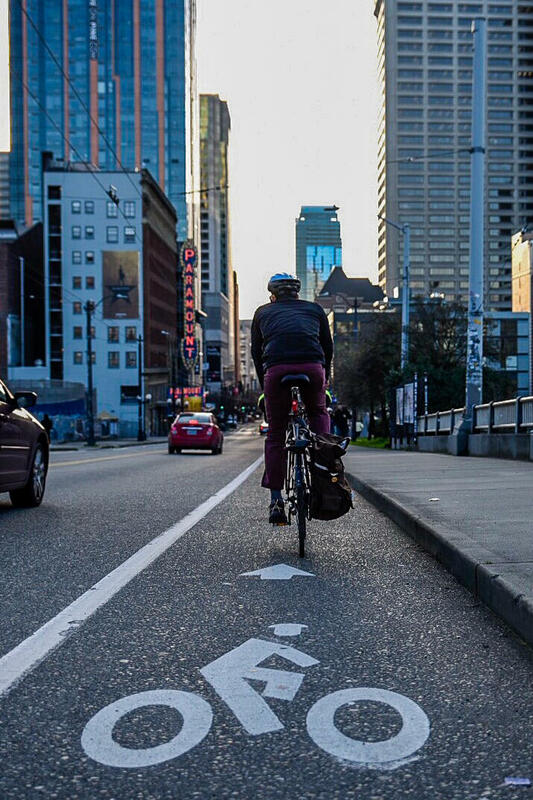 This summer, the Seattle City Council directed SDOT to design and build protected bike lanes in the Pike/Pine corridor by the end of 2019. In October, we hosted a community design workshop with one goal in mind: to bring community members together to develop a design that prioritizes pedestrian safety and comfort, is safe and intuitive for cyclists, and strengthens the vibrant retail environment on Pike/Pine. "The workshop concept is a wonderful example of what can happen when community groups get together and invite folks to be part of a positive change in the neighborhood and to shape public investment." More than 150 people collaborated in small groups to identify priorities and issues, and to envision a street design that meets the community’s needs. Want to see additional photos from the Pike/Pine Protected Bike Lane Community Design Workshop? We want your perspective, too! Whether you live, study, work, own a business, eat, shop or pass through the Pike/Pine corridor, please share your thoughts about the street design through this survey. Your input will help to create a community-supported vision connecting the City’s plans with your needs and ideas for a healthy street. Take our survey here to provide input! See what others are saying and share the survey on social media using bit.ly/PikePineSurvey and #PikePineDesign. Please share your thoughts about the street design before the survey closes on December 31st. We'll analyze the input we receive, and provide the data and a summary to City staff and elected officials. This information will also inform our advocacy as we work with the community and the City to create a safe, vibrant, thriving Pike/Pine corridor. What is the Pike/Pine Renaissance: Act One plan? The Pike/Pine Renaissance Plan redesigns the Pike/Pine corridor between 1st and Melrose (or Bellevue) with an emphasis on pedestrian comfort and placemaking. The one-way streets extend up to Melrose (or Bellevue), and include one-way protected bike lanes on the left side of the street. The Pike/Pine Renaissance bike lanes end where our focus area begins, and one consideration with the potential alignments on Pike is how eastbound cyclists will move from the Renaissance lanes to the eastern lanes, especially if the eastbound lane continues on the south side. Why doesn't Pike/Pine Renaissance go all the way to Broadway? Pike/Pine Renaissance is a project of the Downtown Seattle Association and the City of Seattle’s Waterfront project. It's downtown-focused, but the plan goes from market to market (Pike Place Market to Melrose Market). Why not have a westbound protected bike lane on Pine? Many people bike west on Pine between Broadway and 2nd, in part because the street is one-way westbound downtown and in part because there are painted bike lanes on Pine. So it makes sense that we'd assume westbound lanes would be on Pine. The City considered making Pike and Pine one-way all the way to Broadway and continuing the bike lanes from downtown on the same side of each street. But making Pike and Pine one-way would mean rerouting buses onto Pike that currently travel on Pine -- and rerouting those buses would require new trolley wires, which would likely cost tens of millions of dollars. If the buses aren't rerouted, it's very challenging to find space on Pine to install a protected bike lane and provide adequate space for bus loading and unloading. We've been told repeatedly that it's unlikely to happen. Since our goal is to understand the community's priorities and be able to advocate for them, we're focusing on the alignments that are likely to occur. Why aren't we widening the sidewalks? The scope of the project doesn't include changing the sidewalks. Widening the sidewalks, in particular, would be difficult with the limited space in the street. However, if we hear loud and clear that people in the community prioritize wider sidewalks over parking spaces or other allocations, we'll communicate that. What's the timing of all this? SDOT will have protected bike lanes, in some form, installed between 2nd and Broadway by the end of 2019. We expect the lanes between Broadway and Bellevue to be in their permanent position, though not in their final state. They'll probably be paint and posts in order to construct them quickly, with aesthetic improvements to come in the next couple of years. The lanes between Bellevue and 6th will be temporary, and they may change periodically to accommodate traffic changes resulting from the construction of the Washington State Convention Center Addition. Sometime in the next few years, when construction of the Convention Center Addition is complete, the Pike/Pine Renaissance Plan will go into effect and the we'll have those lanes will become permanent. What does the Washington State Convention Center have to do with all of this? The Convention Center Addition is in the Pike/Pine corridor. Because traffic flow will change during construction, any lanes put in between Bellevue and 6th now will likely need to change again. That's why they'll be temporary lanes for now. The Convention Center Addition is also the source of the funding for the project. $10 million for Pike/Pine protected bike lanes between 2nd Ave and Broadway was included in the Community Package as part of the Washington State Convention Center public benefit.